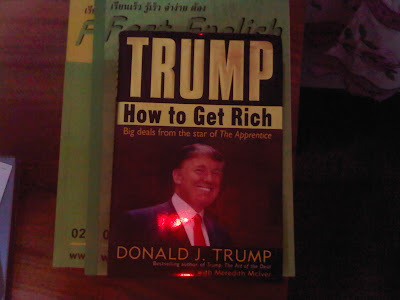 "Trump: How to get Rich" is written by the star of the hit reality TV program "The Apprentice", Donald Trump. It is a candidly written account of the daily events in the life of Trump. He discusses real estate, business leadership, his empire, the media, and "the art of the hair"! How to Get Rich is far from an academic read, which makes it a fast paced conversational-like book. The author is one of the most well known faces in New York, particularly after the success of his reality TV program, where he made the term "You're Fired" famous. Trump is a proud man that is proud of his achievements and is quite happy to talk about them. Depending on how the reader takes the information he presents, one could look at the book as simply being self promotional and self aggrandizing or one could look at Trump's stories as being inspirational and something to aim for. Donald J. Trump's "How to Get Rich" probably won't make you rich like the title suggests, but it is an entertaining read. "The best negotiators are chameleons. Their attitude, demeanor, approach, and posture in negotiation will depend on the person on the other side of the table." "Having a well developed ego, contrary to popular opinion, is a positive attribute."